I love working with daring couples to take engagement photography to the next level. 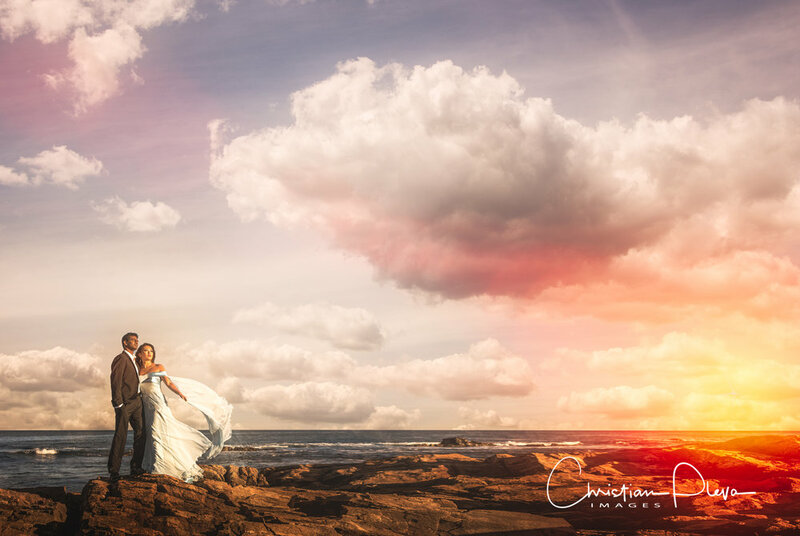 We met with Christina and Vamsi to discuss the look and feel on their shoot and Christina had a pretty specific vision to do something dramatic. From her dress to the location and time of day. I think we pulled it off! We took a trip up to the rocky beaches of Gloucester and these two were troopers working their way out onto the jagged rocks in the name of art. Or at least our artistic imagery. I had a blast shooting and trying to balance a few lightstands to make their vision come to life. Here are a few sneak peeks as well as a little of Christina and Vamsi's story. Vamsi and Christina met as undergrads at Caltech, where they were both in the same student house. A few months after they started dating, Vamsi graduated and left for Harvard to start medical school. Christina had just finished her freshman year, and for the next three years they kept up a long distance relationship. When Christina graduated college, she joined him at Harvard, where she started medical school just as he was graduating again. Fortunately, Vamsi matched to Harvard for his neurosurgery residency and was able to stay in Boston. Four years later, Christina also matched to Harvard for dermatology residency, and Vamsi proposed soon after in Ipswich, Massachusetts. We had an amazing time! Both of us have absolutely no idea how to pose in front of a camera, and Christian guided us through every step and made us feel really comfortable. He also understood immediately the looks we were going for and exactly what was needed to achieve them.